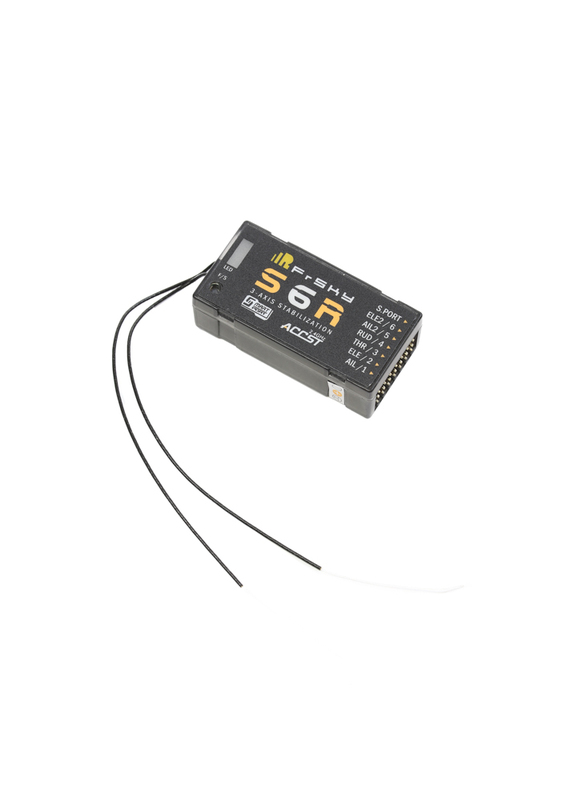 The S6R receiver from FrSky is designed for use in RC airplanes. It's works as a traditional 6 Channel PWM Rx, but it also has a built-in 3 axis gyro and a 3 axis accelerometer sensor module. With the built-in sensors the S6R will compensate for outside forces on the aircraft and will enhance the stability of your model making it easier and smoother to fly. The S6R supports automatic leveling, hover and knife-edge for conventional models and automatic leveling for Delta wings and V-tail. These model types can be enabled via S6R.Config or S6R.lua PC software. The gain can be adjusted in flight by assigning one of your transmitters sliding or rotary controls to the gain adjustment to increase or decrease the sensitivity. 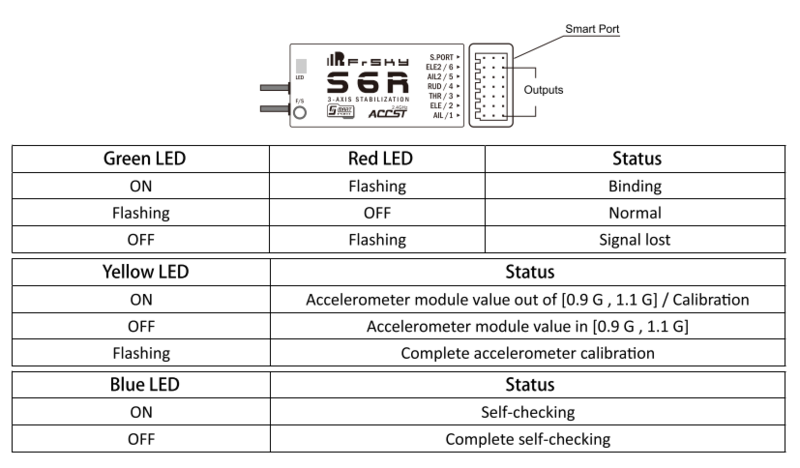 The S6R has 6 conventional output channels, built-in battery voltage sensor and is "Smart Port" enabled allowing you to use the hub-less sensors as well as the older analog sensors. OFF: Rx will behave as a normal receiver without any compensation. Stabilization: Rx will compensate against external force to enhance stability of the model on three axes (Pitch, Roll and Yaw). Automatic Level: Rx will make the model return to level flight after the AIL & ELE sticks being released to neutral. Hover: Rx will orientate the model's nose straight up. Knife-edge: Rx will orientate the model with a wing pointing upwards.